Clayton Diving Club: Clayton Diving Club's 2013 Chrismas Parade! Clayton Diving Club's 2013 Chrismas Parade! 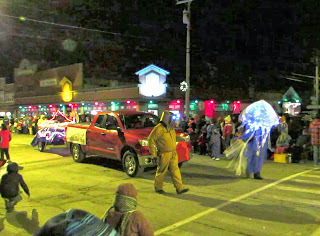 The Clayton N.Y. 51st Annual Christmas Parade theme was A NIGHT AT THE MOVIES. Clayton Diving Club's float recalling the memories of the classicscience fiction novel "Twenty Thousand Leagues Under the Sea" by French writer Jules Verne published in 1870. The book had several movie including animated ones with variants story lines. Sitting on their Nautilus was a large black Octopus and leading the floatwas a glowing jellyfish. Walking besides the float were hardhat divers with their helmet mounted with lights. Displayed on the tow vehicle was the original Clayton Diving Club red scubaflag with its distinctive white vertical bar that dates from the 1960's.